Marvel at the world’s highest sand dunes, float through the Okavango in a dugout “mokoro” canoe, and meet the San Bushmen in the blazing Kalahari Desert on this epic overland adventure. 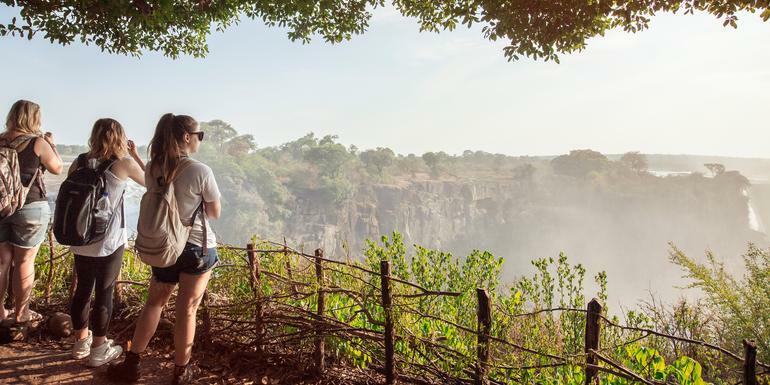 Journey across nearly half of the African continent – from the southern tip of Africa to Kenya – and soak up the vibrant colours, culture, and scenery of eight countries. Our Landos (overland adventure vehicles) are an adventurous and affordable way to enjoy the region’s intriguing combination of wilderness and rural villages while camping under Africa’s big sky will provide a unique perspective. Take the road less travelled and come away with jaw-dropping photographs and a deeper understanding of this incredible continent. Participation camping (28 nts), permanent tented camp (1 nt), full-service camping (2 nts), simple hotels (3 nts), basic bush camping (2 nts), guesthouses (2 nts, multi-share), hostel (1 nt, multi-share). Your Local Living Moment: Kande Beach Local Dinner, Kande Beach. Entrance to Fish River Canyon, Sossusvlei Dunes, and Spitzkoppe. Entrances and wildlife safari drives in Etosha and Serengeti National Parks and in Ngorongoro Crater. Damaraland Living Museum visit. Okavango Delta overnight bush camping excursion. Guided tour of spice plantation (Zanzibar). 3-day Zanzibar excursion. All transport between destinations and to/from included activities. Marvel at the view of Mt. Kilimangaro from this city that is the typical start point for many of the safaris of Tanzania. This small town is located in the northern part of the country at the foot of Mt. Meru. The capital, largest city (1.4 million) and industrial port of the country, it was founded in 1862 by the Sultan of Zanzibar (lies off the coast). It was the capital of the German East Africa Company from 1891 – 1916. Windhoek is Namibia’s capital and largest city (population, 1988 estimate, greater city, 114,500).